Suberb and very rare image of an old, steam powered, brewery dray. This one was operated by the brewer Thomas Whewell. 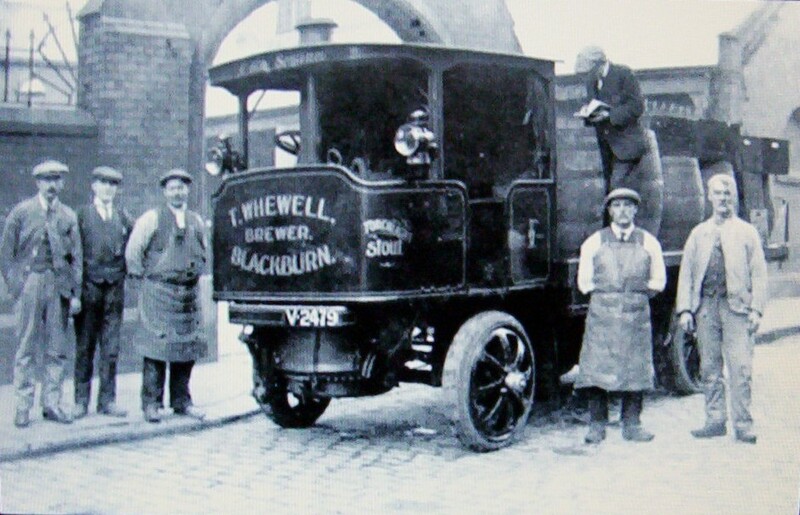 Thomas Whewell's Victoria Brewery was on Adelaide Street, which was in the Montague Street / Wensley Fold area. That is very probably the gateway to the brewery they are stood outside. Judging by the clothes, I would date this photo to the 1920's. PHOTO COURTESY OF THE COMMUNITY STUDIES DEPT. BLACKBURN LIBRARY. Spot on with your observation as regards this being the gateway to the brewery , the arch stood over the entrance to the brewery yard with the tall tower like construction facing . I wonder if it was built as a brewery or if it was converted to this use ? , the high tower construction could this have bee n built as a water tower for the brewing processes. ? . 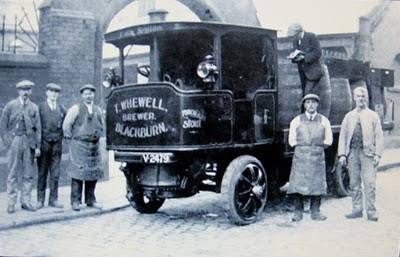 The other breweries in Blackburn seemed to have access to their own water supply ! . Have you any ideas as regards this matter . Sorry David, in my last reply to you about the brewery, I said Thomas Whewell introduced the brewing system. It should have read that he introduced 'the tower brewing system'. So I'm assuming he was the one that built the tower there for that very purpose. I only have a little information about Victoria Brewery, in a book. All it really tells you is that in 1868, a man called John Smith (not that one, I don't think) established a brewery on that site and then, as mentioned above, he sold it to Thomas Whewell a few years later and it was he who introduced the tower brewing system.